Harvey Wang, “Adam Purple and The Garden of Eden, Lower East Side,” 1985; black & white C-print; open edition signed by artist (produced for the 25th Anniversary of the destruction of the Garden of Eden, 2011), 11 x 14 in. One of the landmarks of the Lower East Side in the 1980s was Adam Purple’s Garden of Eden. 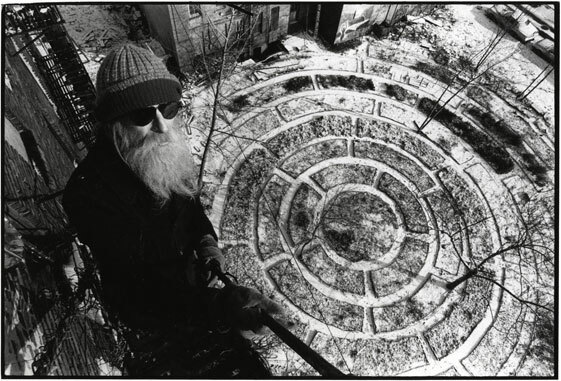 Adam Purple’s pioneering transformation of a rubble filled vacant lot into a tranquil oasis for meditation made him a hero of the urban gardening movement and there was much controversy when the City demolished his garden in 1986. This signed photograph is from a new edition of C-prints produced on the occasion of the 25th Anniversary of the garden’s destruction.